Our Read-and-Write Braille Slate is a breakthrough in note-taking for the blind. Simply roll your paper into the device, write your message from left to right, and roll out the paper when you're done. This one slate can write on materials as small as labeling tape to as large as a full sheet of letter-sized paper. Finally, your Braille slate is affordable, versatile, portable, and easy! Produce notes or letters quickly and easily using our new compact and portable Read-and-Write Slate. 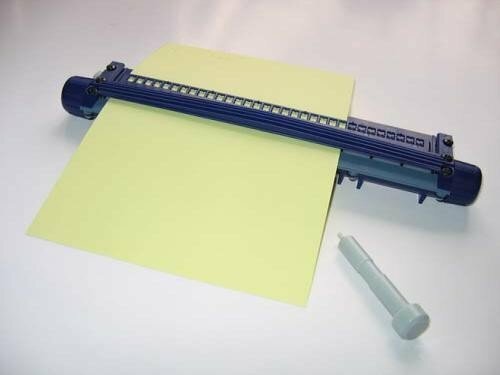 This lightweight braille writing frame is unique in that the paper can be fed into it just like a Brailling machine, such as the Perkins Brailler. It can be used with many sizes of paper up to Letter or A4 size, and can also be used with Braille Labeling Tape. So how does it work? Well, this is an upward writing slate, which uses a unique hollow-tipped stylus to produce the dots. Yes, that's right - Braille is written from left to right, so you don't have to worry about reversing characters as you write or having to turn the paper over to read what you have written! The slate has a 32 cell capacity, which makes it ideal for letter writing, labelling and note taking. It allows you to check each line of braille produced by simply rolling the paper ahead one line, which moves your new line of Braille to the reading tray. Each line space is easily recognized by a reassuring click and noticeable stop action, so lines are always properly spaced.